Imagine you have access to all the pleasures of this world: the latest movies, iPods, designer outfits and delicious feasts in the best restaurants. But no one loves you and you cannot trust anyone. On the other hand suppose you hardly have any possessions, yet abundant love flows in your heart and you receive love profusely from others. Which of these two situations do you think would give you happiness? Surely you’d be happier with love. Behind the facade of success, wealth and positions that men and women crave for is the deep longing of the soul to love and be loved. If that’s the ultimate objective, why not lead our lives in a way that helps us experience this phenomenon abundantly? “Offering gifts in charity, accepting charitable gifts, revealing one’s mind in confidence, inquiring confidentially, accepting prasadam and offering prasadam are the six symptoms of love shared by one devotee and another.” (Nectar of Instruction 4) One needs to remember that these six exchanges are not a magic talisman that guarantees loving relationships. One needs to offer these with love. It is not that giving gifts is necessarily love; it’s a medium to express love. It’s more important to examine the motivations behind our acts of love. One may wonder if we are caught in a cyclical reasoning: on the one hand we say these exchanges give birth to love, but on the other we claim that one who has love can perform such exchanges. What comes first, the act of exchange or the feeling of loving emotion? It all begins with respect. If we can begin with the external act of respect with an aspiration to genuinely respect the other person, slowly love begins to grow in the heart. Respect is the seed on which love fructifies. “Respect is what we owe, love, what we give,” said Phillip James Bailey, an American singer and winner of seven Grammy awards. Respecting others costs nothing, but the reward is rich and fulfilling. Usually those who always respect others feel love swell in their hearts, and the act of respect in itself makes one feel loved. Lord Caitanya Mahaprabhu taught this principle in his dealings with everyone. Sarvabhauma Bhattacarya upheld a philosophy that was diametrically opposite to Lord Caitanya’s teachings. When the Lord first arrived in Jagannatha Puri, Sarvabhauma treated him like a young boy who needed scriptural training. Although Lord Caitanya’s followers were irked by what they thought was a demeaning attitude of Sarvabhauma, the Lord took no offense. He treated Sarvabhauma with great respect, and eventually won his heart. 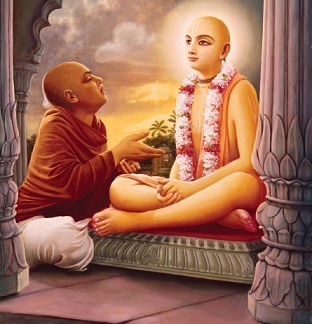 In another instance, the proud Ramacandra Puri, a person on the level of Lord Caitanya’s spiritual master, always kept finding faults in the Lord’s actions. But the Lord always remained humble and respectful and never argued or protested. To love and feel loved is a universal need, and the act of giving respect sets the ball rolling. Respect another person and see how love grows. The next time you have a social interaction, remember that the other person may need your love, and you too would be happy to receive his love. But if that sounds vague, just follow the principle of giving respect. In time everything else will follow.